The CAW wheat beer competition is a chance given to the students in Freising to demonstrate their brewing skills and their brewing talent. With the generous support of our raw materials partners we will provide the best and finest raw materials and you will provide all your creativity to brew the best wheat beer of the year! Subsequent we will answer all your questions about the CAW wheat beer competition. Wheat beer classic: a top-cropping (top-fermenting) beer which consists of at least 50 percent of wheat malt and has a gravity between 12 and 13,5 on the Plato scale. There are no special regulations about hopping. However, you should not use more than three different kinds of hops. Wheat beer creative: The only requirement is that the beer consists of at least 50 percent of wheat malt to give you the chance to brew creative, fruity or very strong wheat beer. This year, the creative category is under the special theme "Christmas and winter wheat beer". How much beer shall I brew? We know that not every student owns a big brewing vessel. Therefore we ask you to brew 10 to 20 liters - an amount that can easily be brewed in small vessels at home. Who will provide the raw material for my beer? 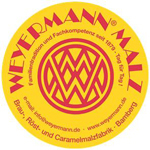 The malt is a generous donation of the Malzfabrik Mich. Weyermann® GmbH & Co. KG Specialty Malting Factory in Bamberg. You can choose your favourite malt out of this list. The CAW will later collect it during the field trip to Bamberg and will bring it to you! The hops is a generous donation of the Simon H. Steiner, Hopfen, GmbH from Mainburg. You can choose up to three different kinds of hops out of the ten different hops provided (see list here). The maximum amount of raw material we will provide equals the amount you need to brew 20 liters of wheat beer. Shall I fill my beer in bottles? Yes! We would ask you to hand in your wheat beer filled in bottles. You can choose the shape and the design of the bottle yourself. Be creative! While the jury will only judge your wheat beer there will be a special judging for the design of the bottle and you can win a special prize for best design. In order to assign the bottles, we ask you to put a label on every bottle. What is the First Prize? For the second and the third place of each category an exclusively compiled wheat beer package that will include a wide selection of fine wheat beers will wait. Also, a special prize for the best bottle design and an audience prize is offered, which are also awarded wheat beer packages. The size and composition of the wheat beer packages depends on the respective price category. For the first prize the brewery Weisses Bräuhaus G. Schneider & Sohn GmbH will award you an exclusive day in their brewery. Your winning beer will be part of the breweries professional tasting panel and you will get a guided tour through the brewery. In addition, you will receive a gift card for the Schneider Bräuhaus im Tal in Munich. Up to 12 teams are able to participate in the competition. Each team can have up to 3 members. Just fill in the participation form. The registration deadline for the CAW-Weißbierwettbewerb is the 25th of June 2018! Is it possible to participate in both categories? Yes, this is possible. You can specify (1st choice) and you sign up for the 2nd category as well. Depending on the number of registrations, we will inform you after the registration deadline, if you can also compete in the 2nd category. When do I have to hand in my beer? The tasting event of the CAW Wheat Beer Competition will take place in early December. Currently, Friday, the 7th of December, is scheduled as appointment, but the booked event room has not yet been confirmed. Thus the date to hand in the beer will be Thursday, the 6th of December, 2018. As soon as the event room has been confirmed, an announcement is sent by e-mail.